In the previous article we saw how to build Linux Kernel and run it on Skoll Kintex 7 FPGA Module using Xilinx Platform Cable USB and XMD. Though this is the easier method, there are a couple of drawbacks associated to it. You will need a Xilinx Platform Cable USB which is slightly expensive and the images are programmed to SRAM/DDR instead of SPI flash. It is possible to program the onboard SPI flash with the images which would retain contents even after power cycle and this can be done without buying expensive JTAG cables. To program the onboard SPI flash with, we will need to make a single binary image that will contain the following individual images. A bootloader is necessary here to copy the Linux kernel from SPI flash to DDR and execute it. The primary requirements for the bootloader is that it should be capable of reading data from the SPI flash and should fit within the BRAM cache size. 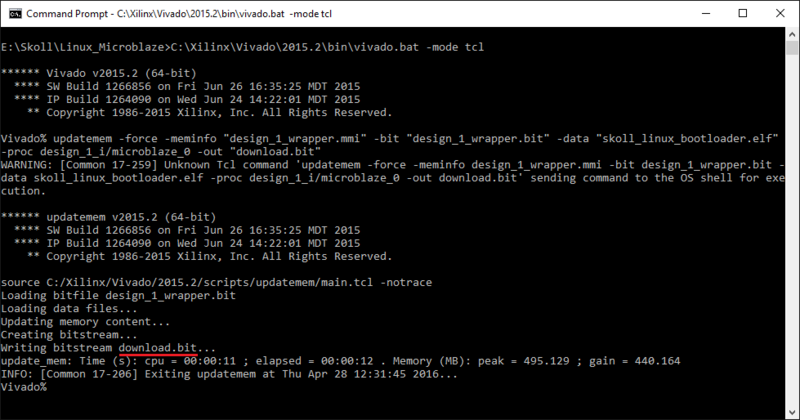 To build a bootloader, launch SDK from Vivado and create a new application project. Let’s call this project “skoll_linux_bootloader”. When selecting the application template, select “Hello World”. 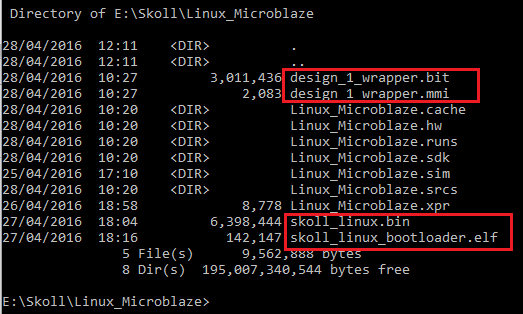 Once the project is created, open the “skoll_linux_bootloader” project in the “Project Explorer” on the left. Double click on the linker script lscript.ld and make sure that all sections are mapped to BRAM (should look something like microblaze_0_local_memory_ilmb_bram_if_cntlr_microblaze_0_local_memory_dlmb_bram_if_cntlr). If not, map all sections to BRAM manually and save the linker script. After saving linker script, build the project and make sure that no errors are reported. Open helloworld.c in the project and replace the entire code with the code below. Please note, the code below is a bare-bones bootloader designed to be simpler than being robust. //Send the address from where the image needs to be loaded. Rebuild the project with newly added code and make sure that no errors reported. If any errors pop up, please fix them before continuing. The above code will load the kernel image from SPI flash memory and write to DDR and jump to kernel entry point. This code assumes that the kernel image is sitting at a specific address in the SPI flash (0x500000 in this case) and has a specific size (0x700000) in this case. 0x700000 is little bigger than the actual kernel image but that shouldn’t cause any problems. The area starting from 0x000000 to 0x4FFFFF is reserved for FPGA configuration data (enough to hold configuration data for 7K70T devices whose bitstreams’ size is 3011324 bytes, or 0x2DF2FC bytes in hex). So in essence, we are targeting the following memory map for the SPI flash binary image we are going to create. 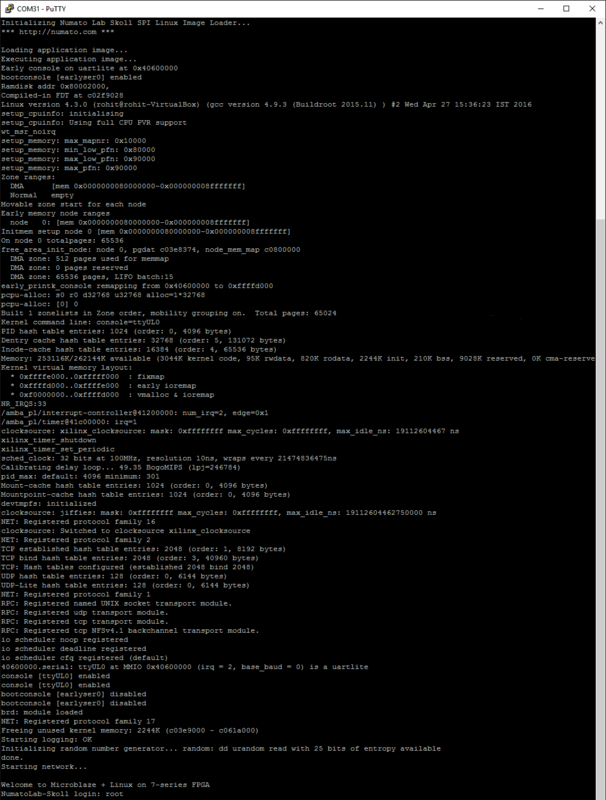 At this point, we have the bit file for FPGA configuration, Linux kernel image and bootloader image we just built. Before we can proceed with packing these images in to a single binary file, there is one crucial step we need to do. You may remember that fact the the kernel image we built (simpleImage.skollkintex7) is in ELF format. This is helpful when downloading kernel using XMD but the metadata (in addition to executable code) is going to be a problem since our bootloader does not understand ELF format. One option is to add ELF loader code to bootloader but it is going to be time consuming and simply an overkill for such a simple implementation like this. Another option would be to strip the metadata and generate a pure executable binary file. This can be easily done with objcopy tool (objcopy is part of gnu binutils). But the tricky thing here is that you can not use any objcopy (eg: objcopy built for host machine). You will need to use objcopy that is built for Microblaze. Fortunately, buildroot already built cross objcopy that runs on host machine but can work on Microblaze executables. This happened when we built the Linux kernel earlier (buildroot builds all cross tools needed for building the kernel). All that we need to do is to find where these cross compiled tools are placed by buildroot. With the specific buildroot version we used, the objcopy executable we need was placed in the directory “output/host/usr/microblazeel-buildroot-linux-gnu/bin” under the buildroot root directory. Switch to output/images directory under buildroot root directory where Linux kernel image is available in ELF format and execute the following command. If the command was successful, you will see a new file created with the name skoll_linux.bin. Copy this file over to the Windows machine. 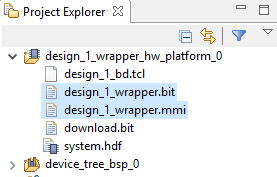 On the Windows machine, place the following files in the same directory. In my case, I have the following files in my directory as shown in the image. Your file names may be different depending on the project names etc..
With all necessary images available now, let us move forward with creating the final binary image. We will do the following steps to create a single binary image. Merge the FPGA configuration (.bit file) and the Bootloader executable image (.elf). This is because the contents of the executable needs to go in to the FPGA BRAM when FPGA initialize after power up. 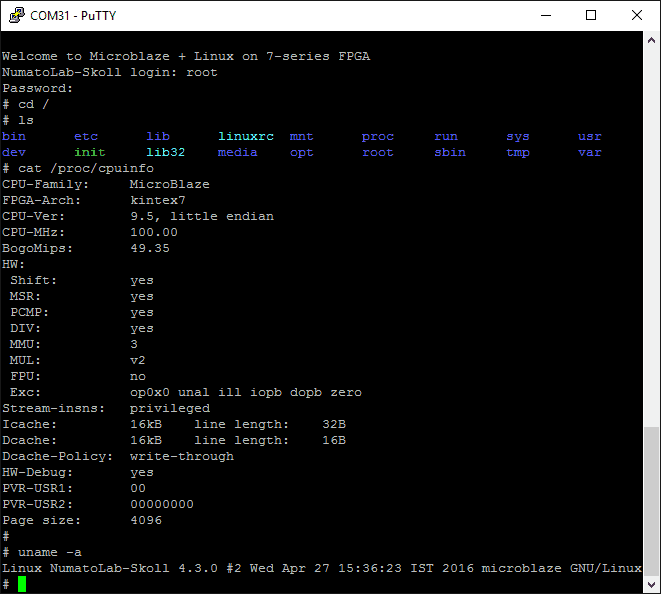 Concatenate the combined FPGA configuration file (generated in previous step) with Linux kernel image. To merge Bootloader executable image with bit file, run the following command. cmd> updatemem -force -meminfo "design_1_wrapper.mmi" -bit "design_1_wrapper.bit" -data "skoll_linux_bootloader.elf" -proc design_1_i/microblaze_0 -out "download.bit"
If the command ran successfully, you will see a new file created in the directory with name “download.bit”. This file now has both the FPGA configuration stream and Bootloader code. Now we can concatenate the FPGA configuration file we just generated (download.bit) with Linux kernel binary image (skoll_linux.bin) to create a single binary image that can be downloaded to the SPI flash. Run the following commands to generate single binary image. If this command succeeded, you will see a few new files in the directory and one of them would be “download.bin”. This is the final binary image that we need to download to Skoll’s SPI flash. The following image shows all files in my directory after executing all above mentioned steps. The final image is approximately 11.1MB in size and this leaves with approximately 4.9MB of available space in the SPI flash for custom user data. 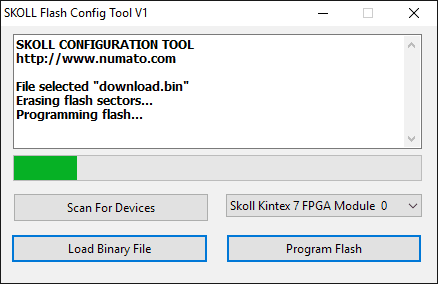 Now download the latest Skoll Kintex 7 FPGA Module configuration tool from the product page and use that to download the final binary image “download.bin” to the SPI flash (see image below). It may take a couple of minutes for the download to complete. While download is in progress, go ahead and start you favorite serial terminal emulation program (Hyperterminal, PUTTY, TeraTerm etc..) and open the COM port corresponding to Skoll’s FT2232 channel B and set baud rate to 115200 and set handshaking to off/none (You should have configured channel B of Skoll’s FT2232H as serial port. If not, please follow this tutorial to do so). Once the binary image is completed downloading, the tool will reboot the FPGA and let it load the configuration data from newly downloaded image. If everything went well, the bootloader will start copying Linux kernel image to DDR and you will see the below message in the serial terminal emulation software. It may take a few seconds for the bootloader to copy the Linux kernel. Once copying is completed, bootloader will start the kernel and you will see the kernel booting as shown below.